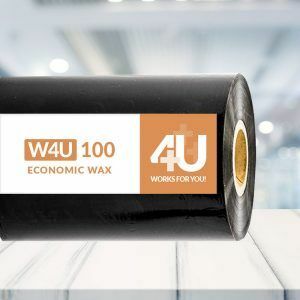 +W4U Wax thermal transfer ribbons that provide great printing quality and performance for all-purpose marking and work just fine for applications like retail, shipping and warehousing labels. Wax ribbons are an economical way of printing. Low print energy required. Suitable for flat-head printheads and printers. Are you looking for a ribbon suitable for paper labels and rough label surfaces? The black universal wax ribbons are for cost-effective printing on matte and uncoated paper labels (Vellum).